The next time you crave for fresh seafood produce from Japan, Niigata City may just be what you need. Facing the Sea of Japan, this picturesque port town is home to an endless array of seafood and one of the largest global rice producer in Japan. Well, this makes it almost necessary for you to enjoy their signature produce such as Koshihikari, which is considered to be the best of all Japanese rice. 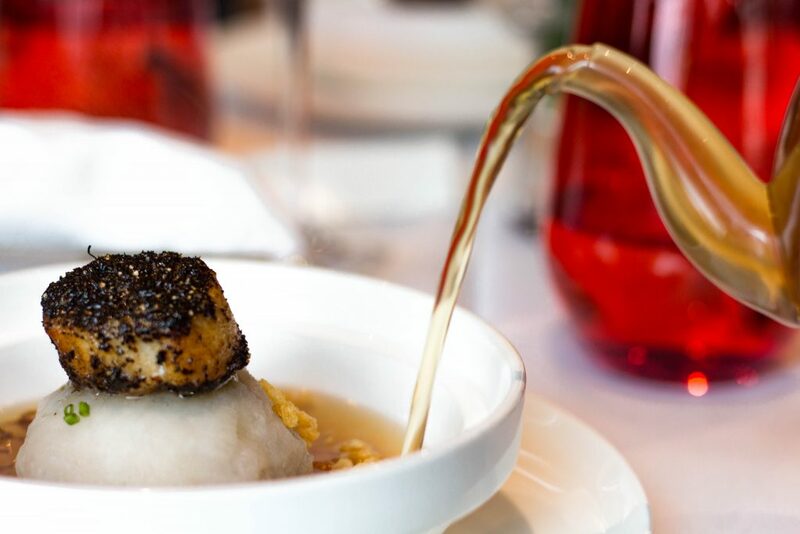 Surely, the best time to indulge in these delicacies from Niigata City is now as Chef Ken Ling from Tóng Lè Private Dining is putting together an exquisite six-course menu, available only until 11 November. This only gives you more reason to indulge in this specially curated menu, which is one you must not miss and here’s why. Sazae (海螺) is also known as a horned turban sea snail. While turban shell is not commonly found in Singapore, it may soon be given how palatable it is. 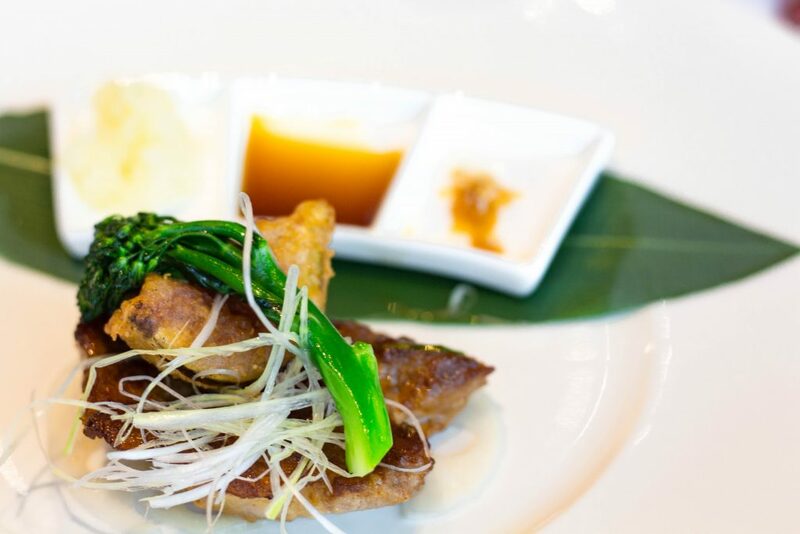 If you are one who prefers your appetiser to be light yet flavoursome at the same time, Sazae is just what you need. The Kelp noodle (umi shomen) in this dish is very well marinated with mirin, bonito and yuzu – making for a zesty touch to this exquisite dish. This prized delicacy in Japan also packs a punch with its savoury taste while providing you with rich vitamins and minerals. Maitake Mushroom, Nameko Mushroom, Tomato (野生菌, 番茄). 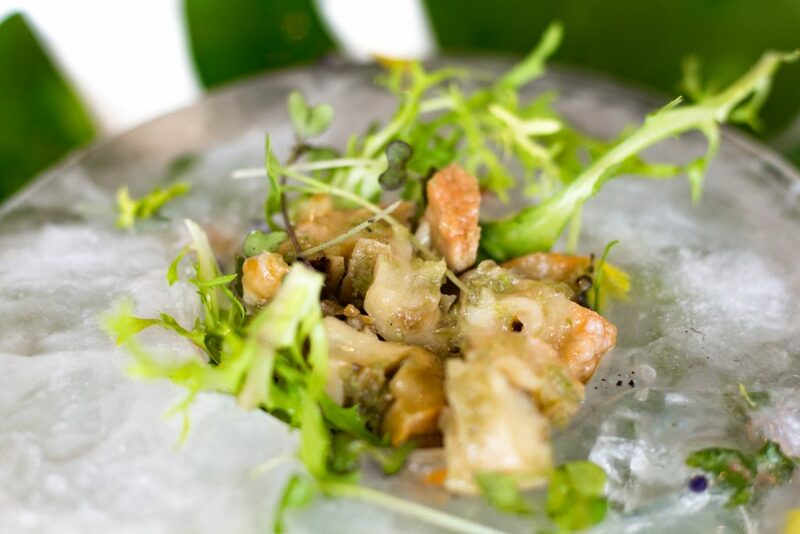 For the second course, it boasts of an unbeatable trio of Maitake Mushroom, Nameko Mushroom and Tomato. The particular types of mushroom have been chosen to enhance the flavour of this sweet and piquant tomato-based soup. In Japan, Maitake Mushroom is known as the ‘Dancing Mushroom’, which is a natural flavour enhancer giving the soup a savoury flavour. As for Nameko Mushroom, its mellow earthy flavour simply tingles your tastebuds with subtle notes of cashew. Altogether, this soup makes for a rich source of vitamins; with one of its health benefits to help fend off infections.
) served alongside Japanese golden leek and eryingii mushroom on the side. Fish lovers certainly would not be able to resist this particular type of seabream (also known as snapper), especially given its naturally buttery taste. 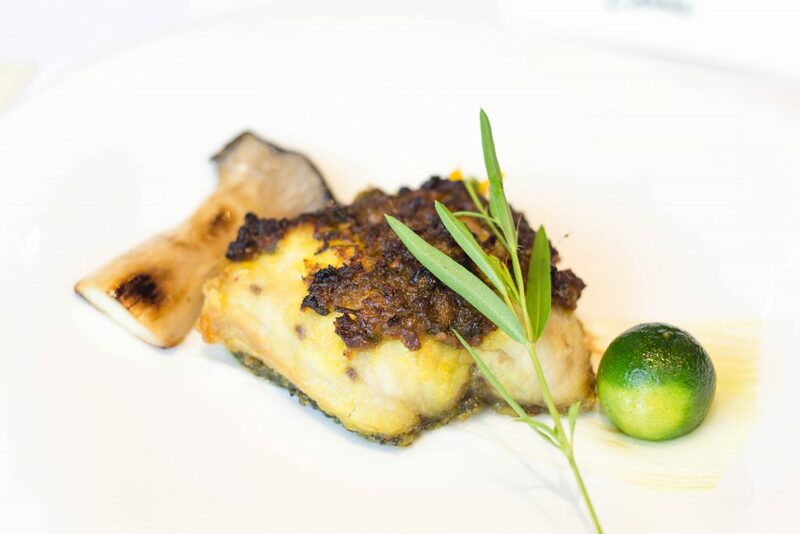 In case you were wondering why does the third course bear much resemblance to one of the iconic local dishes – Sambal Stingray; your thought is not unfounded. 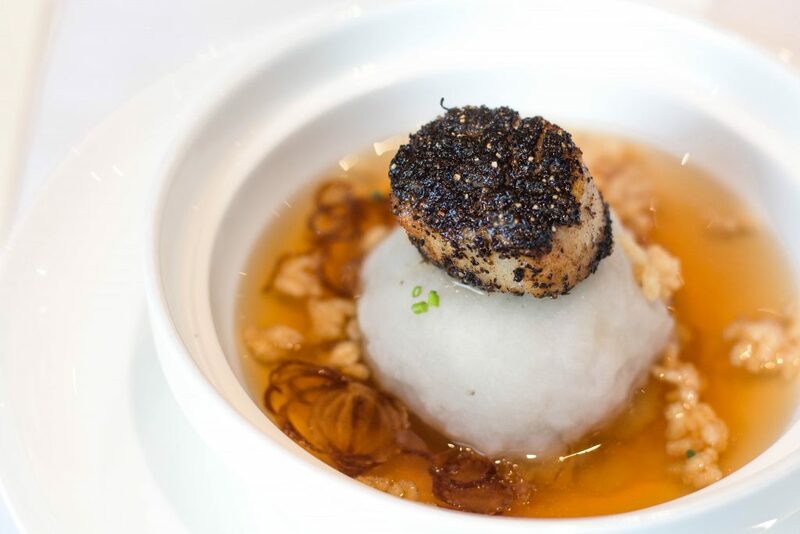 Chef Ken Ling at Tóng Lè Private Dining found inspiration from this quintessential seafood dish that we locals adore very much. Now, you get to relish the umami taste of this Japanese version of stingray with a slightly spicy paste; that is made from a tantalising blend of turmeric, yellow ginger, dried shrimp, garlic, shallot and lemon grass. As with the local dish, Medai is best enjoyed by squeezing the calamansi to further enhance the flavour of the spices that the paste is made of. There is no way you can go wrong with a well put together Kurobuta dish. Often touted as the ‘Kobe beef of pork’, the richly marbled Kurobuta pork simply melts in your mouth with its juiciness. The pork in the dish is also marinated with garlic and leek; whiled served alongside a deep fried fig and sautéed lotus root at the bottom to accentuate the variety of flavours in here. There are even three different sauces to complement the umami taste of the Kurobuta pork; namely grated radish with yuzu, yuzu soy sauce and sea salt. Now you can easily this course in different ways; while savouring the rich flavour of the quality pork. The seafood soup is being poured into this palatable Uonuma Rice (魚沼市米). As the name of The Niigata City Set Menu suggests, Niigata’s famous rice certainly takes centrestage in this specially curated set menu. Noted for its sweet and nutty flavour, this particular type of grain originates from a city located in South Central Niigata Prefecture. This city is also renowned for producing the crown jewel of Japanese short-grain rice. As you tuck into this Uonuma Rice, you will also taste a medley of flavours. 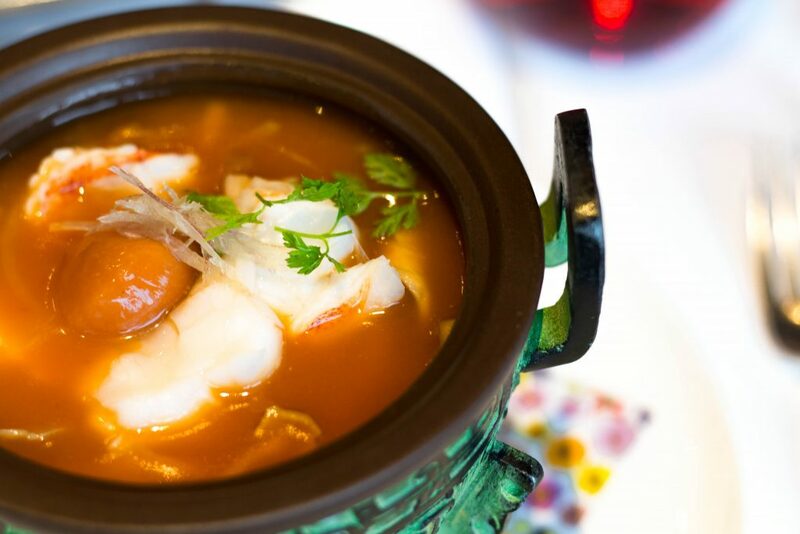 The sweet and nutty taste of the rice is well complemented by the full-bodied seafood soup that leans more towards the savoury side. 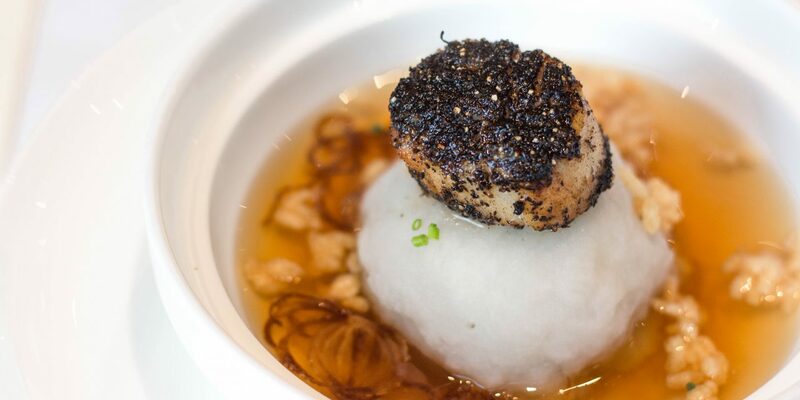 Topped off with crusted Hokkaido scallops, the rice has been cooked and reduced in chicken stock as well as covered in a mashed mountain yam paste alongside deep fried mountain yam cubes. You can be sure to taste different layers that are married well in terms of its taste and texture; giving you a toothsome combination of sweet and savoury flavours. Besides, the slightly sticky texture of the rice adds another facet to an otherwise seemingly unassuming course. ‘Niitaka-nashi’ Pear, ‘Okesa-gaki’ Persimmon 新高梨, Okesa 柿子. 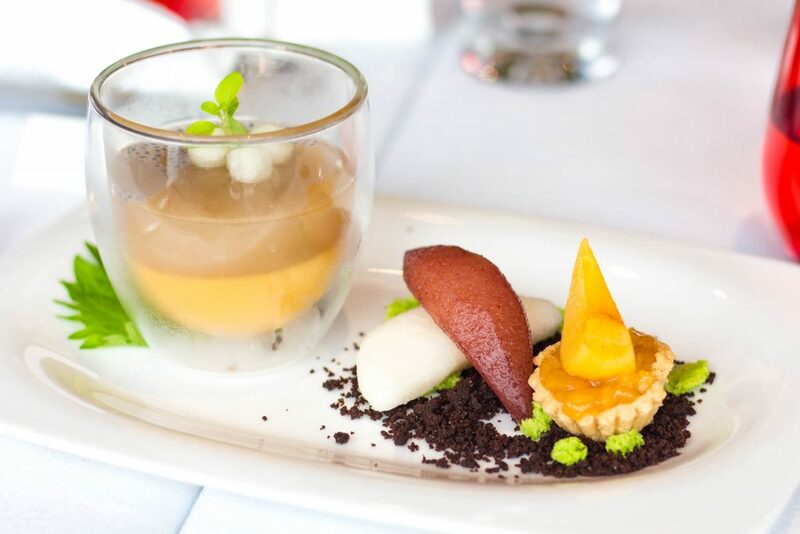 The gastronomic experience is only complete when you end it off on a sweet note and the best way to do so is to start from the right to the left for this fresh fruits dessert. Starting from the right, the persimmon tart has caramelised persimmon and marzipan (almond paste) topped with fresh persimmon. In the centre, there are two types of pear – namely the fresh pear and the pear soaked with red wine. The one at the far left has molten persimmon purée in the bottom layer and topped off with a layer of pear jelly, fresh pear balls and basil seeds. Both ‘Niitaka-nashi’ Pear and ‘Okesa-gaki’ Persimmon take centrestage in this last course, especially given the rich history and size of the fruit for Niitaka-nashi. The latter has been seen as a famous local produce from Niigata for a long time. This season is timely because the best time to relish this juicy, sweet and cripsy fruit is from the beginning of October. As for Okesa-gaki Persimmon, it is symbolic of Niigata Prefecture’s autumn flavours and well sought after for its smooth, fully-rounded and superior flavours. Shortly put, fans of Japanese cuisine can assuage their intense cravings for a taste of Niigata City temporarily – until their next flight out to this enthralling port town. From 27 October to 11 November 2017, gourmands will be able to relish an exquisite The Niigata City Set Menu for both lunch and dinner. We promise you wouldn’t be disappointed.